There’s a lot of misinformation floating around about contact lenses, and whether you are new to wearing lenses or have been using them for years it can be a bit confusing figuring out what are truly good habits and what is purely myth. For instance, one of the biggest myths is that lenses are expensive, but really you can find cheap contacts online at retailers like Lens.com. While contact lenses were once an expensive item, especially daily disposables, over the years advances have been made to make all lenses more affordable and more comfortable. Comfort is another factor that worries prospective lens wearers. While there is a short adjustment period of getting used to the feel of the lens on your eye, after a few hours to a few days if the lens is properly fitted then you should not feel it at all. If it does still bother you, then you may need to get reexamined and refitted by your eye doctor, or you can try wearing them for shorter periods to build up your tolerance for them. Whether you wear your contact lenses for a few hours a couple of times a week or for longer periods daily, there is no way that you will actually become completely dependent on them. 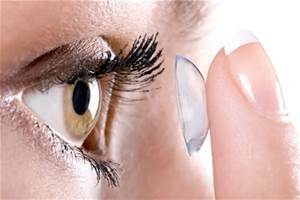 There is a myth that wearing your contact lenses too often will weaken your eyes. This is simply not true. Aging is a big factor in causing your prescription to change along with disease or infection. So don’t worry about becoming too reliant on your lenses, you can enjoy all of the benefits and conveniences that come with lenses as long as you are wearing them within the recommended timeframe prescribed by your eye doctor. Another misconception is that lens wearers can wear their contacts in water. Your lenses should only be exposed to your body’s tears, the fluid that surrounds your eye, or your contact solution. Swimming or showering with your lenses puts you at risk for contracting waterborne infections. These types of infection can have serious consequences and can even result in vision loss. So, as a precaution, always remove your contact lenses before entering water. Lens wearers may also be worried that their contacts will either stick to their eye or, conversely, will fall out of their eye. Both are rare occurrences, and even if your lens gets dried out and adheres to your eye, you can always use lubricating drops to moisten the lens again enabling it to be removed. The risk that you will lose your lens from it popping out is not likely either since each lens is personalized to specifically fit your eye. This tighter fit prevents your lens from becoming dislodged. In addition to preventing your lens from falling out, a customized fit also debunks the myth that an ill-fitted lens is okay to wear. Besides potentially becoming dislodged, an ill-fitted lens will not function properly. In order to see clearly with contact lenses they need to fit your eye correctly, so if you feel like your lens needs an adjustment you should get in touch with your eye doctor immediately.